We offer a comprehensive range of AC Drives, VFD, Variable Frequency Inverters, Variable Frequency Drives, Closeloopwhich includes of Vector Control IClosed Loop Vector Control Inverter, Mini Vector Control Frequency Inverter, Frequency Inverter, Water Pumps Inverter and Elevators Inverter. 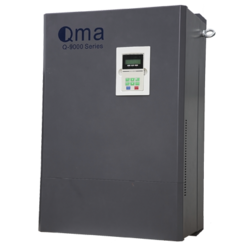 Our range of inverters encompasses QMA Q5000, Q7000, Q9000, micro processorQ8000.Our range is used for any Horse Power/KW Rating. Auto Tunning Facility for ultimate performance of Motor Control. Closed Loop Servo for Injection Molding Machinery. In addition to the above-mentioned products we also offer DC drives, automation panels, industrial elemi CRO processor, controlled Instruments, counters, timers and temperature Controllers. We manufacture our assortment of frequency inverters using premium quality raw material that includes electronic part like the capacitor, resistors, PCB, IGBT, braking resistors and much more. We procure raw material from well-established companies from countries like Malaysia, Singapore, Korea and Taiwan.